2517 Rio Tiber Drive, Punta Gorda, FL.| MLS# C7404635 | Million Dollar Listing Team with Global Luxury Realty | Fort Myers, FL. "We specialize in Luxury Homes, Waterfront Homes, and Beach Homes!" SAILBOAT WATER! 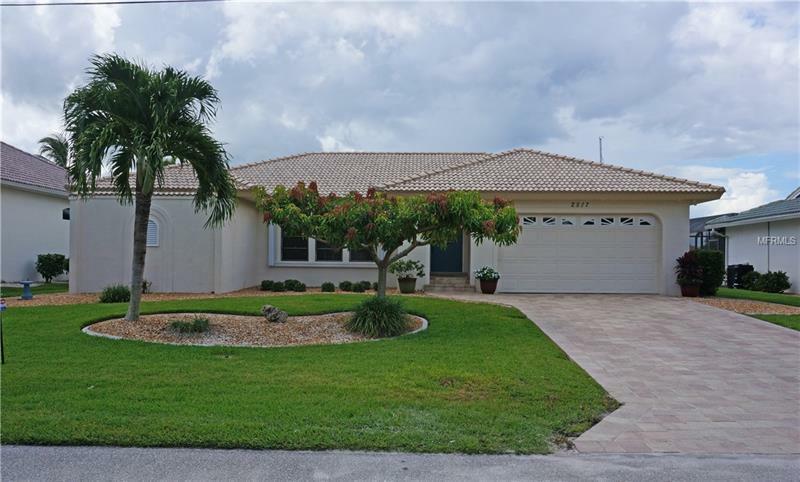 Impressive 3 Bedroom 2 Bathroom home with attached oversized 2 Car Garage located in the desirable deed restricted community of PUNTA GORDA ISLES. This home is located on a quiet dead end street with cul-de-sac and offers a Great Room, Family Room, separate Dining Room, well appointed Kitchen and Inside Laundry. The Kitchen features pretty white cabinets, granite counters, breakfast bar, dining area and pass thru to lanai. The Master Bedroom suite has a walk in closet, wood floors and private bathroom with dual sinks, walk in shower and separate jetted tub. Guest bedrooms have walk in closets. Murphy bed.The guest bathroom has a vanity, granite counter, tub/shower combo and is also a Pool Bath. Your living space extends to the screened lanai and pool area with brick paver deck, outdoor shower and summer kitchen with sink, refrigerator and Jenn-Air grill. There is a heated inground gunite pool with valet cleaner. SOUTHERN exposure. There is also a BOCCE BALL COURT in the back yard! Features include city water and sewer, barrel tile roof, hurricane shutters, intercom, central vacuum, tile floors throughout the living areas and guest bedrooms, wood floor in master bedroom, brick paver driveway and walkway. Per owners: NEW overhead plumbing 2006, NEW roof 2004, NEW pool cage 2004, NEW cage screens 2014, NEW A/C 2010, NEW pool heater 2011, Pool resurfaced 2014, brick pavers 2016, Hurricane shutters 2018. 80 foot concrete seawall, concrete dock, kayak lift and float. 2 storage areas with locks. Million Dollar Listing Team Sells a lot of Homes! Million Dollar Listing Team is top producing luxury agents who sell Million Dollar Homes throughout Florida. As top agents we sell waterfront homes and beach homes in Florida. Our website Million Dollar Florida Homes makes it easy for you to search and find Million Dollar Homes and Million Dollar Condos For Sale in Florida. Search and find beachfront homes and mansions for sale in the beautiful State of Florida. If you are searching for Luxury Homes for sale in Florida you have found the right site. We sell Luxury Homes in Florida! Million Dollar Listing Team can help you find your waterfront home and gulf access home in Florida. We post new Million Dollar Homes for sale every day. See Million Dollar Homes For Sale in Naples, Florida and Marco Island, Florida. Search Million Dollar Homes and Mansions For Sale in Port Royal Naples. We make it really easy for you to see the newest Million Dollar Homes For Sale in Sanibel Island and Captiva Island. If you are looking for a riverfront home in Fort Myers, Florida or Cape Coral, Florida we can show you riverfront homes for sale. Million Dollar Listing Team can help you find your dream home to buy in Bonita Springs, FL and Fort Myers Beach, FL. If you are searching for an oceanfront home in Barefoot Beach or in Siesta Key Sarasota you have found the right Luxury Agent to help you. Our team is made up of top producing luxury agents in Florida. We sell Million Dollar Homes throughout Florida! On this website you can preview Million Dollar Homes for sale in Orlando, Tampa, Miami, Fort Lauderdale, and throughout Florida. Million Dollar Florida Homes is a leading luxury website that can help you find your Million Dollar Home in Lakewood Ranch, Bradenton Beach, Holmes Beach, Longboat Key, and throughout Florida. Million Dollar Listing Team can help you find your dream home to buy in Osprey, Florida and Nokomis, Florida. We sell Beach Homes in Casey Key, Boca Grande, and Manasota Key Englewood, Florida. If you prefer a Million Dollar Home with acreage or a ranch in Alva, Florida or anywhere in Florida, we can help you find your home. As agents who specialize in selling Million Dollar Homes throughout Florida, we work with many Million Dollar Home buyers. If you are looking to purchase a Million Dollar Home in a gated community we would love the opportunity to work hard for you. Trust our years of real estate experience selling Million Dollar Homes in Florida. Million Dollar Listing Team makes it easy for you to use our site and search Million Dollar Homes for sale in major Florida cities including Tampa, Sarasota, Clearwater, and Orlando. Just type the city name, community name, or zip code where you would like to purchase your Million Dollar Home and we will show you the most current Million Dollar Homes For Sale in the area. 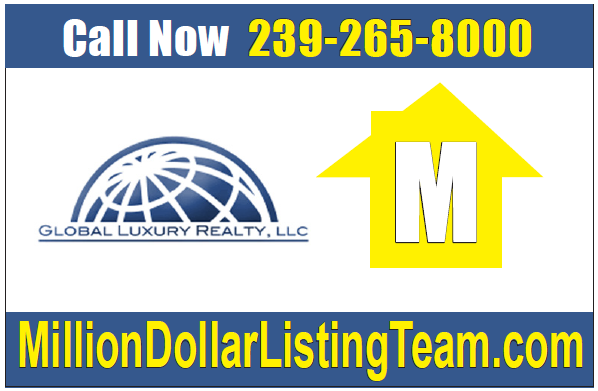 If you need to sell your Million Dollar Florida Home you will want to speak with Million Dollar Listing Team! We are proud to be top luxury agents with Global Luxury Realty. Contact Us at 239-265-8000. Copyright © 2019 Mid Florida MLS. All rights reserved. The data relating to real estate for sale on this web site comes in part from the Internet Data Exchange Program of Mid Florida MLS. Information provided is for consumer's personal, non-commercial use and may not be used for any purpose other than to identify prospective properties consumers may be interested in purchasing. Global Luxury Realty participates in the MFRMLS Internet Data Exchange (IDX) program, allowing display of other MFRMLS broker's listings on this site. However may not include all listings currently available. Information is deemed reliable but not guaranteed. Information last updated at 2019-04-18 21:37:12.